To use covafillr with JAGS, JAGS must be installed before the covafillr package, and the package must be installed using the same compiler as JAGS is installed with. The package will only be installed with the JAGS module if the configure argument --with-jags is given. Note that the package must be compiled with the same compiler as JAGS. Note that more examples are available in the inst/examples folder. 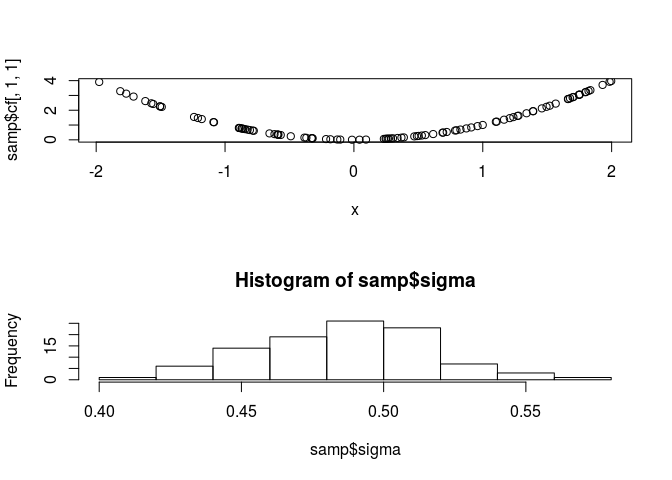 The package can be used from R to do local polynomial regression and a search tree approximation of local polynomial regression. Both are implemented with reference classes. The reference class for local polynomial regression is called covafill. To illustrate the usage we simulate data. 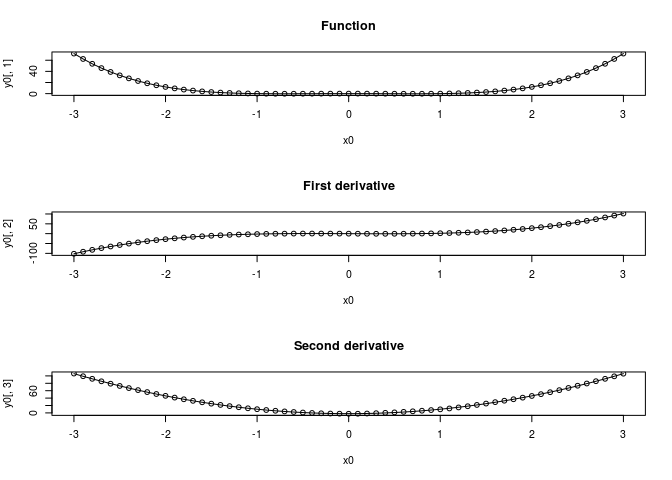 To do local polynomial regression at a point, the $predict function is used. 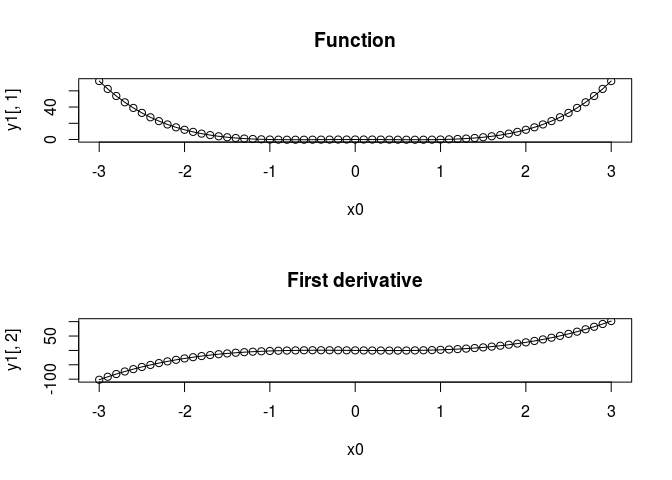 The function returns a matrix of estimated function values and derivatives. ##      "initFields", "getRefClass", "trace", "field"
covatree has an aditional argument, minLeft, which is the minimum number of observations at which a sub tree will be created. Otherwise the functionality is similar. The covafillr package provides a plugin for inline. The following code does local polynomial regression at the point x based on the observations obs at the points coord. For convenience, the plugin provides the type definitions cVector and cMatrix to pass to the covafill constructor and operator. An R function can now be defined with inlined C++ code using plugin='covafillr'. To use covafillr with TMB, include covafill/TMB in the beginning of the cpp file. Instead of calling the usual operator, the covafill object is evaluated at a point with the evalFill function. This function enables TMB to use the estimated gradient in the automatic differentiation. From R, the cpp file must be compiled with additional flags as seen below. Then TMB can be used as usual. If covafillr is installed with JAGS, a module is compiled with the package. The module can be loaded in R by the function loadJAGSModule, a wrapper for rjags::load.module. Then rjags can be used as usual. - It is now possible to get standard deviations for estimates with covafill. - covafill$predict now set colnames correctly for p=2. - Weight matrix in covafill used sqrt of kernel weights. - $copy has been disabled for covafill and covatree reference classes. - .Object has been removed from argument list in $initialize  for covafill and covatree reference classes.